Is this component-testing bench for the everyman? Maybe not the perfect test bench, but if you are looking for one, then Lian Li's PC-T60A is one of the better ones you can buy. It's fair to say that a test bench isn't the first thing the majority of the population's wish list of computer hardware. However, to a small minority of people hiding away in darkened room testing lots of motherboards or graphics cards, or torturing a CPU within in a inch of its life through overclocking, they're a very useful tool. Well, they're certainly better than just using the top of the motherboard box to test on. One of the latest test benches to hit the market, the Pitstop PC-T60A, comes from the well-known case manufacturer, LIan Li. 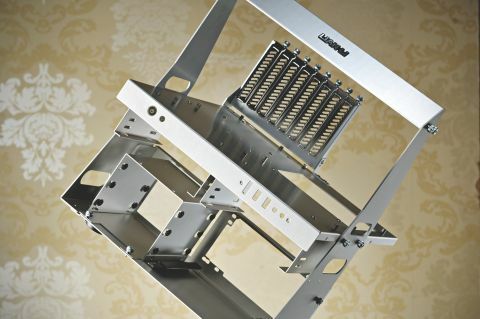 Although the Pitstop PC-T60A is a DIY product, it shows all the same attention to detail and build quality that Lian Li is known for in its PC case product lines. It comes in three colour versions; brushed aluminum (PC-T60A), anodised black (T60B) or red (T60R). The first thing that strikes you about the PC-T60A is how light it is. At just 1.8kg you may think that the materials Lian Li have used have been compromised to keep the price down, but not a bit of it. Opening the box reveals that all the major components are made from high quality 1.25 or 2mm thick aluminium. The Pitstop PC-T60A can handle motherboards from micro-ATX up to full-size ATX, but if you're into testing very small mini-ITX boards then Lian Li has that covered with the PC-7T version. Assembly starts with screwing the side panels to the bottom base plate and then adding the PSU support brackets, again fixing with screws. Together with the optical drive fittings and PCI slot mount, these are the only major components that are screwed together; everything else is fixed with thumbscrews. Because of Lian Li's attention to detail and how the PC-T60A has been designed, putting it together poses very few, if any problems. A nice touch is the inclusion of rubber anti-vibration pads on the PSU support brackets and mounting grommets in the drive bay cage, which will help reduce the noise and vibrations of the PSU and any hard drives you fit into the cage (it can hold up to three drive). There's a second drive bay directly under the motherboard tray, which can hold a couple of 2.5-inch drives, ideal for holding SSDs. If you like tidy cable runs, then the PC-T60A will really disappoint; it's without any form of cable management, so keeping everything tidy is pretty much an impossibility. A lot of thought has been put into the PC-T60A, but if you know anything about Lian Li products this won't come as a surprise. The design and quality of the components make putting it together a doddle. A fan cooler and a multi I/O port are only available as additional extras; the fan cooler at least should really be included, because the PC-T60A doesn't have any cooling fans included as standard. The top cross member, which also doubles as a carrying handle, can get in the way of some of the larger CPU air coolers. The other thing missing is any form of cable management but many people won't be too bothered by this.